Carol Becker, dean of the Columbia University School of the Arts, presents Pauline Oliveros with the William Schuman Award. The Schuman Award honors the lifetime achievement and lasting significance of a contemporary American composer, and carries a prize of $50,000. 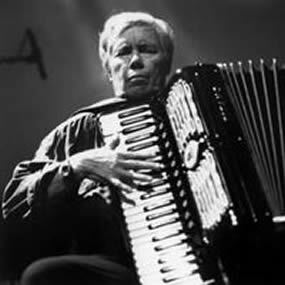 Its previous winners include John Zorn, Steve Reich, and Milton Babbitt; Oliveros is the first woman to receive the Schuman Award. performances will be interspersed with spoken tributes from friends and colleagues of the composer. German Radio, Oliveros’ commitment to interaction with the moment is unchanged. Through Deep Listening Pieces and earlier Sonic Meditations Oliveros introduced the concept of incorporating all environmental sounds into musical performance. To make a pleasurable experience of this requires focused concentration, skilled musicianship, and strong improvisational skills, which are the hallmarks of Oliveros’ form. In performance Oliveros uses an accordion which has been re-tuned in two different systems of her just intonation in addition to electronics to alter the sound of the accordion and to explore the individual characteristics of each room. provided leadership within the music community from her early years as the first director of the Center for Contemporary Music (formerly the Tape Music Center at Mills), as director of the Center for Music Experiment (during her 14-year tenure as professor of music at the University of California at San Diego), and as an advocate for organizations such as the National Endowment for the Arts, The New York State Council for the Arts, and many private foundations. She now serves as Distinguished Research Professor of Music at Rensselaer Polytechnic Institute and Darius Milhaud Composer in Residence at Mills College. Oliveros has been vocal about representing the needs of individual artists, about the need for diversity and experimentation in the arts, and in promoting cooperation and good will among people.